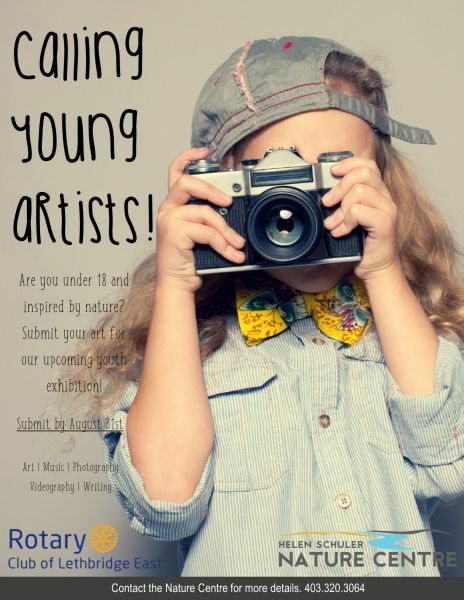 The Helen Schuler Nature Centre is inviting youth artists to participate in the next community art gallery exhibition “Inspired by Nature.” Anyone in Alberta under the age of 18 is invited to express interest and submit work as part of the display sponsored by Rotary Club of Lethbridge East. Submissions must be inspired by nature and can be art (drawing, painting, sketching, etc), music, photography, videography, or creative writing. The exhibition itself will run September 11 thru November 4, 2018. It will feature a mix of indoor and outdoor installations as part of this year’s Art Walk. A Gallery Closing reception will be held on October 30, 2018 and will provide an opportunity to recognize the amazing submissions and award prizes to "Best in Show." Families are encouraged to make the most of summer by spending time outside together and encouraging closer connections with nature! Time spent in in the great outdoors will provide many fantastic memories as well as ample opportunities to create original art to display as part of the “Inspired by Nature” youth art gallery exhibition. Benefit #1 - Parks in Lethbridge are valued by residents.